Welcome to Dynamic WooltexManufacturer & Exporter of Non Woven Fabrics ProductsEstablished in 2002 at Jaipur, we are an ISO 9001 certified company. Australia, NZ, Europe & America are some of our major markets and we are supported by Ethical business practices & Ultra modern manufacturing units. Thorough inspection of products, complete customer satisfaction & Competitive prices are thereasons behind our success. Our product range includes Poly Fill, Filter Media & Wool Products. 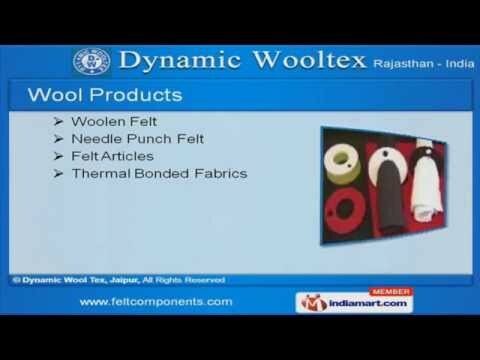 Felt Articles, Woolen Felt & Thermal Bonded Fabrics are available under Wool products. We offer Poly & Thermal Waddingâs under Poly Fill that are superior in quality. Filter Media offered by us is best in the industry amongst others. Our Polyfill for Filling Purposes are extremely reliable. We also provide Polyfill for Jackets, Quilts and Furniture Purposes that are a class apart.